Bryce Canyon National Park is located in southern Utah on the eastern side of the Paunsaugunt Plateau in Garfield County, and horseback riding is a great way to tour the Bryce Canyon area. Settlement of the area began in 1874. Ebenezer Bryce moved from Pine Valley (near St. George) and settled a site near the mouth of Bryce Canyon in 1875. Mr. Bryce used the now famous canyon as a cattle range, and it was given his name as early as 1876. 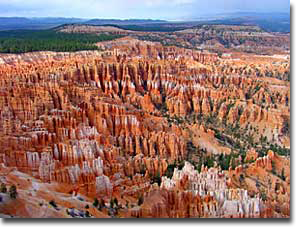 Bryce Canyon is a series of natural amphitheaters below which stands an array of white and orange limestone columns and walls sculptured by erosion. The erosion has been accomplished mainly by rain, snow, and frost prying off cliff fragments, rather than by stream erosion. Nearby streams actually flow away from the canyon. The high rim country of the park is part forest dominated by fir, pine, and aspen, and part meadows of grass and sage. At lower, drier altitudes, pinon pine and Utah juniper predominate. Bryce Canyon awaited promotion and development before its full tourism potential could be realized. National Forest Supervisor J. W. Humphrey was transferred from the La Sal National Forest to the Powell National Forest on 1 July 1915. He was amazed at the beauty and grandeur of Bryce and resolved to do all he could to promote it and make it accessible. He took visiting dignitaries to Bryce and secured funds for a passable road to the canyon rim. In 1916 Arthur W. Stevens of the Forest Service wrote an illustrated article for the Union Pacific railroad tourist magazine. J. W. Humphrey wrote a similar article for the Rio Grande railroad. These were the first descriptive articles published about Bryce Canyon. As southern Utah developed, Reuben and Minnie Syrett–who homesteaded just outside the present park boundaries–brought their friends to see the intricately eroded stone formations. By popular demand, they developed sleeping and eating facilities on the canyon rim. They called their establishment, “Tourist’s Rest.” When the area was set aside as a national monument in 1923, the Union Pacific Railroad bought out the Syrett’s interests and began to construct Bryce Canyon Lodge intending to make the Bryce Canyon area part of their new “Loop Tour” of the southwest. The Syrett’s then built “Ruby’s Inn” on their land just north of the park. Horseback riding around the Bryce Canyon National Park area is spectacular. The formations in outlying canyons and the view from area overlooks are awe-inspiring. There is abundant wildlife in the forests and canyons that surround Bryce Canyon and the Grand Staircase Escalante National Monument and while riding horseback you are bound to come across some of this wildlife. The formations that make-up Bryce Canyon are found in many areas around the National Park itself and horseback rides into these areas will give you a great feel for how life was and still is in this western frontier region.